My great-grandmother Cleo lived in simple, wood-framed house on her family’s farm. During her lifetime the road running in front of her home wasn’t paved or even named. Her mail was directed to a rural route number. Behind her house was a large barn filled farm equipment, feral cats, and towers of hay that were as close to mountain climbing that a kid from the sandy, flat lands of South Georgia could get. When I asked my father about my great-grandmother, he shrugged and said she was an orphan and came from people named Hornsby. She died when I was around ten. Being a selfish child, I coveted the upright piano that sat on her back porch. Yes, she had a piano on her porch that weathered the harsh heat and electrical storms that built up in the afternoons. The keys looked like old, yellowed, chipped teeth and made an awful twangy sound when pressed. I was so upset when my father came home with his grandmother’s inheritance: a stack of old quilts. Practical things that were made from unmatched scraps and intended for warmth. 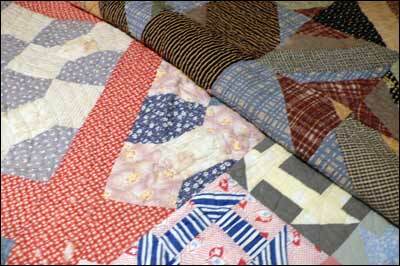 (Keep in mind these were the years before quilting became chic.) I was a disappointed little girl, no piano for me, just ugly, useless, old quilts. Two years ago, when visiting my childhood home in South Georgia, I found the quilts rotting in a closet. I pulled them down and examined them again. This time, I didn’t see the ugly scraps, but the beautiful patterns and the slightly uneven stitches done by my great-grandmother’s own hand. Maybe from my years of writing in silence, I felt this odd sorrow that her work should be stowed away and forgotten. So I bundled the quilts in my car and brought them home. I washed them on the gentle cycle and let them air in the sun. Now they are displayed on the chairs and bed in the guest room where I write. Maybe I’m a little woo-woo, but I like having my great-grandmother’s art around me, keeping me silent company as I write my stories – my own art. >My grandmothers were excellent cooks (one professionally) so I am left with their hand-written recipes and dishes. I cannot make tea in that old pitcher without remembering the everyday art of what they did.Lovely evocative piece. >And there's probably a hundred stories within each stitch! Love this story, Susanna! Glad you saved them. >I know those quilts. I've seen them, and knowing the love in them, the bond with you, they are infinitely more lovely. I'm so glad you saved them from their sad loneliness.I have a few things like that around my house and they aren't just lovely things, they are a thread through the dark of time keeping me tied to my past and my family.